"Cold calling is the lowest percentage of sales call success. If you invest the same amount of time in reading this book as youdo in cold calling, your success percentage and your income willskyrocket. "- Jeffrey Gitomer, Author, Little Red Bookof Selling "You can never get enough of a good thing! Read this bookand USE its contents! "- Anthony Parinello, Author, Selling toVito and Stop Cold Calling Forever Salespeople everywhere are learning the hard way that coldcalling doesn't work anymore. Yet, millions of salespeopleare stuck in the past, using twentieth-century sales techniques totry to lure twenty-first century customers. There has to bean easier way to find prospects - and there is. Today's mostsuccessful salespeople are using modern technology to bringprospects to them, rather than fishing for prospects over the phoneor knocking on doors. 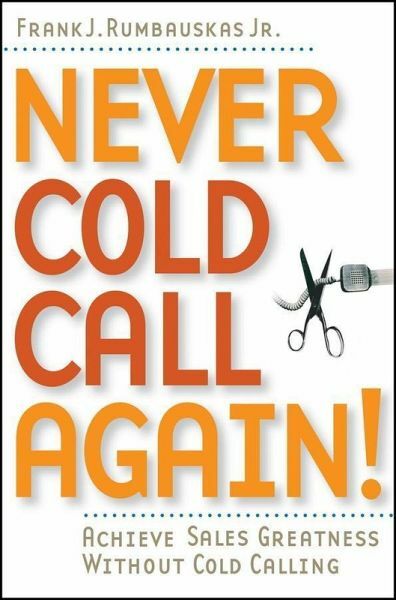 Never Cold Call Again offers practical, step-by-stepalternatives to traditional cold calling for salespeople, smallbusiness owners, and independent professionals who are activelybuilding a client base. The Information Age presents endlessopportunities for finding leads without cold calling. In fact,Frank Rumbauskas's system brings prospects to thesalesperson, rather than the other way around. Readers will findunbeatable sales advice on effective self-promotion, generatingendless leads, how to win prospects using e-mail, prospecting onthe Web, networking, developing effective proposals, and muchmore. Frank J. Rumbauskas Jr. (Phoenix, AZ) provides marketingconsultation and coaching services to firms who wish to providequalified leads to their sales force rather than have them spendproductive work time cold calling. He is the author of theself-published hit Cold Calling Is a Waste of Time(0-9765163-0-6).